Below are Box Office Collection Report of bollywood film 'Qarib Qarib Singlle' With his review, budget and total box office and worldwide collection status. Qarib Qarib Singlle is an indian Comedy, Romantic, Adventure Film of 2017. The movie lead star cast is Irrfan Khan, Parvathy. Directed by Tanuja Chandra and produced by Sutapa Sikdar, Zee Studios. 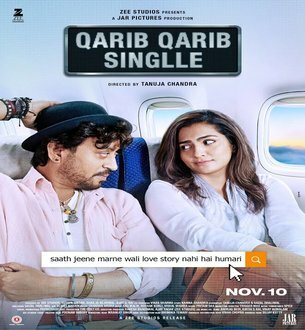 Qarib Qarib Singlle film Released in over 1000+ screens in India. The movie’s opening would be on similar lines though with 2-3 crore more expected on 1st day friday, only to improve substantially over the weekend if there are great critical acclaim, audience appreciation. The story of the film is from Irfan and Parvati. Parvati's husband has passed away and she is living alone. People use it to get their work done. But one day he goes to the dating site by courage, and he meets Zindal and Mastmaula Irrfan Khan. No Tension Attitude Parvati gets accustomed to her style and life. There are two reasons to watch this movie. After a long time, see the film made of Tanuja Chandra's style. Now it is a different matter that this time Tanujja did not have magic like previous films. Irfan Khan's chemistry with South Actress Parvati is also worth seeing.